Set features seven miniature tools. Chain Nose Pliers, Round Nose Pliers, Flat Nose Pliers, Side Cutter, Nylon Jaw Pliers, #5 Knotting Tweezers and Split Ring Tweezers. 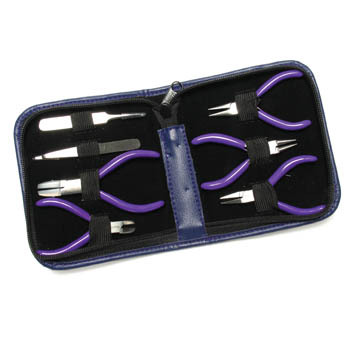 Pliers feature polished steel heads, PVC handles, lapjoint construction, single-leaf springs, and are 3" - 3.5" long.